The Wayland Free Reading Room and Library Society, August, 1893 On the seventeenth of August in 1893, a Certificate of Incorporation was filed with the County Clerk for the Wayland Free Reading Room and Library Society. The name of the association, the number of trustees (10), its location in the village and town of Wayland, and its objects and purposes as a free public reading room and circulating library were all specified in the certificate. The signatures on this document included that of Henry P. VanLiew, Sylvester Dodge, W.H. Lawrence, Josephine Lea Fayette, Mrs. A.H. Salter, Bert Poore, and J.A. Morris. Library Association Reformed, Trustees Elected 1912 On November 4, 1912, those interested in continuing and re-forming a library association were invited to the home of Mrs. Wiley Capron. About 30 ladies were present. A constitution was drawn up and five trustees were elected: Mrs. W.W. Capron, Mrs. W.W. Clark, Mrs. S.M. Furnold, Mrs. H.V. Ordtt, and Mrs. E.A. Lewis. A room in the “bank building” was engaged and made ready to use with chairs, tables, shelves, magazines, and books, all of which were donated. In December of that year, it was decided that the work of securing an absolute charter and a state grant of $100 should begin immediately. The secretary, Mrs. Furnold, was appointed to proceed as rapidly as possible. The application for the charter was signed, sworn to and mailed on December 14th. Charter Granted, First Librarian Begins Work 1913 In 1913, a charter was granted for the Wayland Free Library Association by the State of New York. The first librarian, Mrs. Jeanette Clark, donated her services. Miss Lulu Curtis succeeded her. For ten years she was the librarian, with a starting salary of $2 per week, gradually increased to $5.50 per week. In 1916, Miss Curtis reported a circulation of 8,288 volumes. By 1920, there were 2,260 volumes in the library and 690 registered borrowers. The circulation had risen to 10,500. Library Moves to the American Legion Building 1919 In 1919, a proposition made by the Theodore Van Tassell Post of the American Legion for housing the public library was received and a 25 year lease was granted. The Legion building was home for the library until 1947. Wayland Library Gets New Home and New Name 1947 In 1947, Mrs. Stella Whipple willed her home at 10 Scott Street to the library association, with an additional bequest of $1,000 to be used for remodeling. The formal opening of the Whipple Memorial Library was held on June 29, 1949. Members of the Lowell Club served tea. The reference room was equipped with furniture given by the W.H. Gunlocke Chair Co. Many gifts were made at this time, which showed the great community interest in the cultural side of life in Wayland. Receipts from Mr. John Rausch, a local plumber, and Mr. Leroy Tenbrook, a local lumber dealer, were among the many gifts of money, along with a sign made and installed by Gordon Cooley, husband of the librarian. Mr. Robert Scott and Mrs. Homer Bennett, as well as Mr. and Mrs. William Engel, presented gifts of decor to the library. The trustees, headed by Mrs. Charles Capron and Mrs. Claire Ferry, worked diligently to make the Whipple gift a lovely library. In 1957, Mrs. William Harris was appointed as librarian, Her staff was increased to four and the library was open 6 afternoons and 3 evenings each week. Library Joins Southern Tier Library System 1958 In 1958, the library became a member of the Southern tire Library System, which included 16 libraries in Steuben and Allegheny Counties and grew to include 52 public libraries in 5 counties, adding Chemung, Yates and Schuyler Counties. In 1973, the cultural and educational life of Wayland was advanced once again when Howard and Helen Gunlocke presented the people of the Wayland area with a beautiful new library building–the Gunlocke Memorial Building in honor of his parents, Mr. and Mrs. William Gunlocke, founders of the Gunlocke chair company in Wayland. A professionally trained librarian was hired when Agnes Mazzola,a retired school librarian from Springwater, took the position of Director. Financing for the library was ensured by a proposal that the school district act as collector for taxes to support this valuable and educational community institution. It was then that a levy was assessed for this proposal. Until his death in 1985, Mr. Howard Gunlocke personally paid for the maintenance of the grounds and the building, as well as the utilities. Since that time, the income from a trust fund established by him has fully covered these expenses. 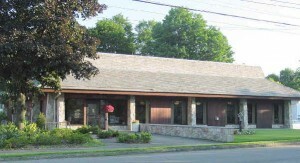 The Library in the New Millennium The Wayland Free Library is one of 375 association libraries in New York State, established by vote of association members as private corporations, which contract with local governments to provide library services. Our library receives funding by contract with the Wayland-Cohocton Central School district for the collection and appropriation of tax money voted on by taxpayers and operating totally independent from the school, except for cooperative programs and collection development.